Henry George Duke was born in Sompting, Sussex, in 1853, the second eldest son of Eliza and Frederick Duke (born c1821, Arundel, Sussex), a carter who had settled in the village of Sompting shortly after his marriage to Eliza Foard in 1850. As a boy, Henry George Duke worked as a shepherd, but by the time he was 18 he was employed as a labourer by a local market gardener. In the March or April of 1883, Henry George Duke married Annie Staplehurst (born 1858, Fletching, Sussex), the daughter of Matilda and John Staplehurst (born c1836, Fletching), a beer-house keeper who ran The Royal Oak public house in the Sussex village of Newick. Before her marriage to Henry George Duke, Annie Staplehurst was employed as an "Under Laundry Maid" at 'Sompting Abbotts', a manor house belonging to Henry Peter Crofts (c1819-1890), Justice of the Peace and Deputy Lieutenant of Sussex. The union of Henry George Duke and Annie Staplehurst produced 9 children - Harry Duke (born 1883 - died 1884); Laura Matilda Duke (born 1885); Alfred John Duke (born 1887); Annie Eliza Duke (born 1889); George Frederick Duke (born 1892 - died 1892)); Lilian Emily Duke (born 1893); Jesse Duke (born 1896); Gladys Duke (born 1899) and May Alexandra Duke (1901). Charlotte Florence Pollard (who was later to marry Alfred John Duke) was born at Ardingly, Sussex, in 1889 and baptised at the local church on 27th October 1889. In the baptism register, Charlotte Florence Pollard's mother is named as Sarah Jane Pollard, who at the time of her child's birth was an unmarried domestic servant in her early twenties. Sarah Jane Pollard, who was born in Pyecombe, Sussex, in 1866, worked as a 'Cook' in domestic service. Charlotte Florence Pollard, who was known as 'Flo' by family and friends, was brought up by her grandparents, William Edward Pollard (born c1834, West Hoathly, Sussex) and Mrs Mary Pollard - formerly Mary Stedman - (born 1838, Brighton). 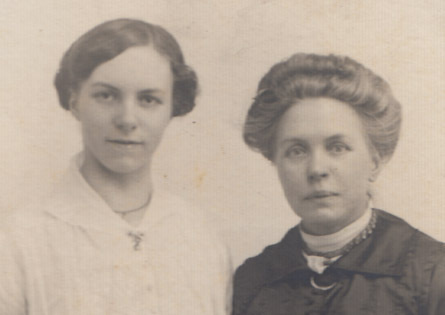 In 1898, Flo's mother, Sarah Jane Pollard married a 37 year old widower Joseph James Caesar (born 1861, Brighton), who worked in Brighton as a 'Grainer' and 'House Painter'. By 1911, twenty-one year old Charlotte Florence ('Flo') Pollard was employed as an "Under Housemaid" at 'Sompting Abbotts', the country house where Mrs Annie Duke once worked. It was probably while working at 'Sompting Abbotts' that 'Flo' Pollard met local market gardener labourer Alfred John Duke (born 1887, Sompting). Alfred John Duke married 'Flo' Pollard in 1917. Alfred J. Duke's wife gave birth to a baby boy named Alfred Henry Vincent Duke on 10th June, 1920. 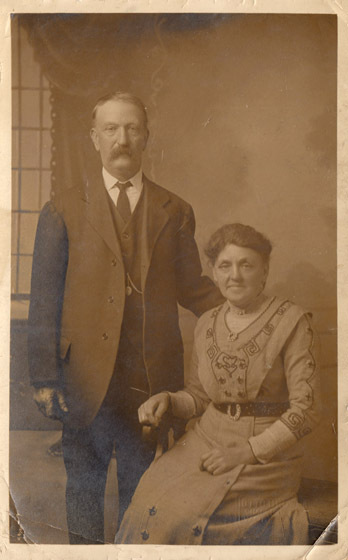 [ABOVE] Henry George Duke (born 1853, Sompting, Sussex) and his wife Mrs Annie Duke (born 1858, Fletching, Sussex) in a postcard portrait photographed by Otto Brown of 2 Chapel Road, Worthing (c1916). Henry George Duke died in 1917, aged 64. 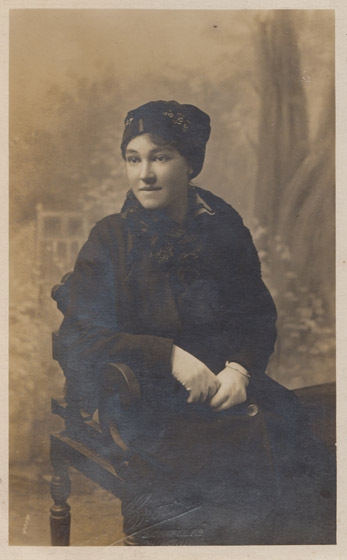 [ABOVE] Mrs Annie Duke, formerly Annie Staplehurst (born 1858, Fletching, Sussex) in a postcard portrait produced by Otto Brown at his Chapel Road studio in Worthing (c1914). At least five of Annie's children had their portraits taken by Otto Brown. [ABOVE] Portrait of Alfred John Duke (1887-1940), a postcard photograph by Otto Brown of 2 Chapel Road, Worthing (c1915). The eldest surviving son of Annie Staplehurst and Henry George Duke of Sompting, Sussex, Alfred John Duke worked as a 'Market Gardener's Labourer". Early in 1917, Alfred John Duke married Charlotte Florence Pollard (born 1889, Ardingly, Sussex). [ABOVE] Portrait of Laura Matilda Duke (1885-1963), a cabinet photograph by Otto Brown of 2 Chapel Road, Worthing (c1907). Laura Duke, who the eldest surviving daughter of Annie Staplehurst & Henry George Duke of Sompting, Sussex, worked as a domestic servant. 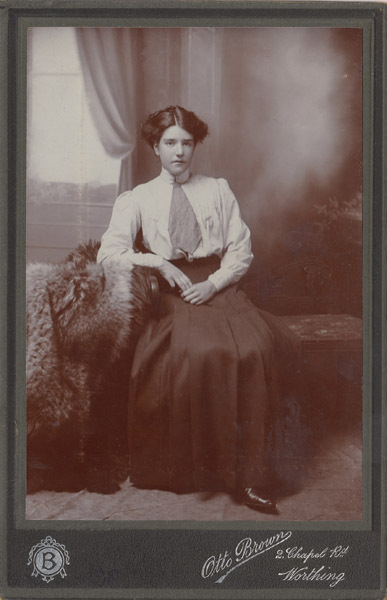 [ABOVE] Portrait of a young woman - thought to be Annie Eliza Duke (1889-1972), a cabinet photograph by Otto Brown of 2 Chapel Road, Worthing (c1907). Annie Duke the second eldest daughter of Annie Staplehurst & Henry George Duke of Sompting, was employed as a 'Housemaid'. 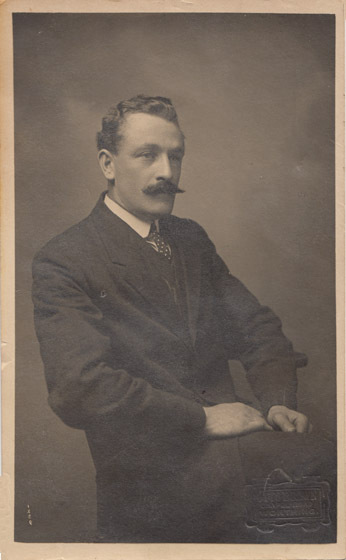 [ABOVE] Portrait of Alfred John Duke (1887-1940), a postcard photograph by Otto Brown of 2 Chapel Road, Worthing, inscribed with the date 'April 9th 1915'. Early in 1917, Alfred John Duke married Charlotte Florence Pollard. 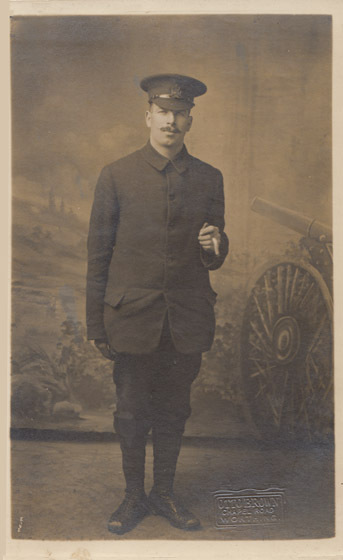 [See postcard portrait, right]. 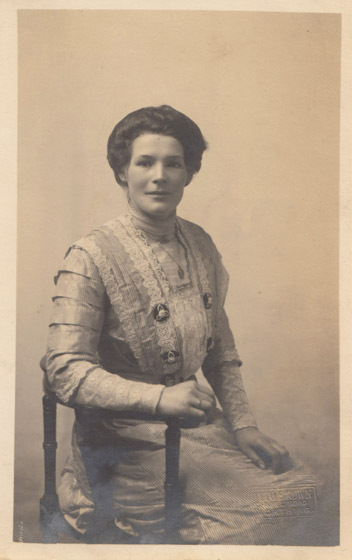 [ABOVE] Portrait of Charlotte Florence Pollard (born 1889, Ardingly, Sussex), a postcard photograph by Otto Brown of 2 Chapel Road, Worthing, inscribed with the date 'April 9th 1915'. Early in 1917, Charlotte Florence Pollard married Alfred J. Duke. 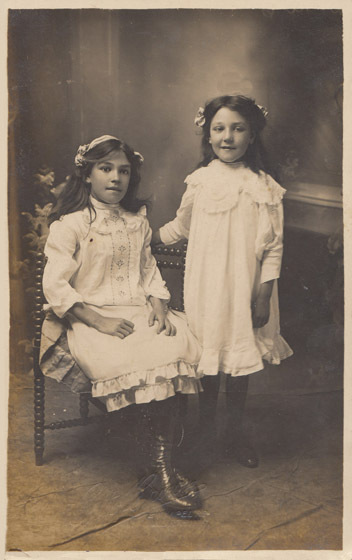 [ABOVE] Gladys Duke (born 1889, Sompting, Sussex) and May Alexandra Duke (born 1901, Sompting, Sussex) a postcard portrait [postmarked 23rd August 1910] photographed by Otto Brown of 2 Chapel Road, Worthing. Gladys Duke & May Duke were the two youngest daughters of Annie Staplehurst and Henry George Duke of Sompting, Sussex. 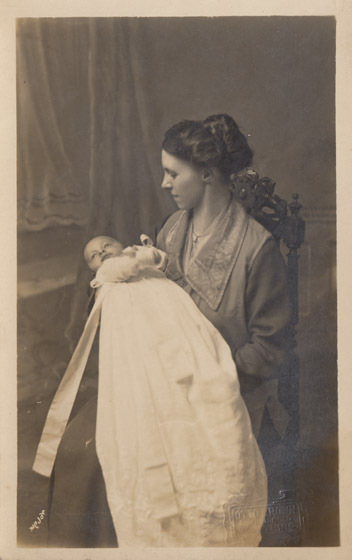 [ABOVE] Mrs Charlotte Florence Duke (the wife of Alfred John Duke) pictured with her baby son Alfred Henry Vincent Duke. The card is inscribed "Alfred Henry Vincent Duke, born June 10th 1920, age 11 weeks ". 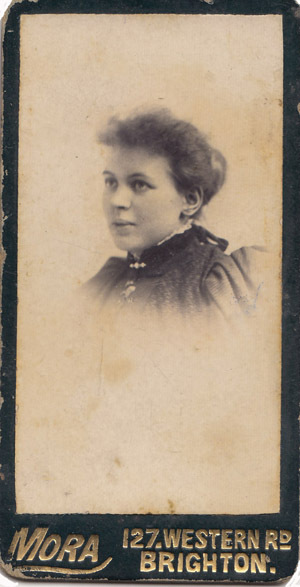 This postcard portrait was produced by Otto Brown of 2 Chapel Road, Worthing. 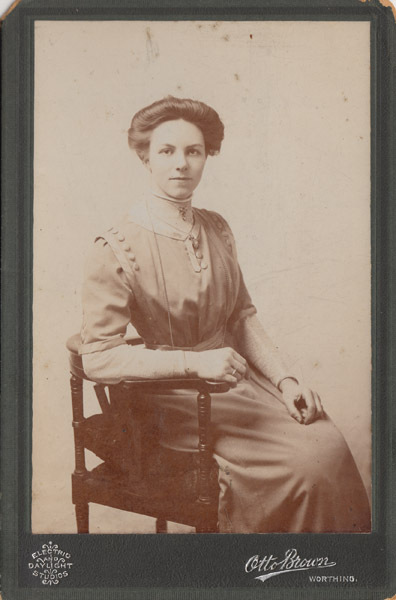 [ABOVE] Portrait of Charlotte Florence 'Flo' Pollard (born 1889, Ardingly, Sussex), a cabinet card photograph by Otto Brown of 2 Chapel Road, Worthing (c.1915). 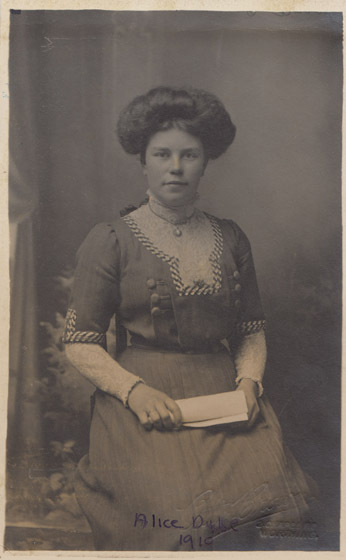 [ABOVE] Portrait of Charlotte Florence 'Flo' Pollard (born 1889, Ardingly, Sussex), a cabinet card photograph by Otto Brown of 2 Chapel Road, Worthing (c.1908). 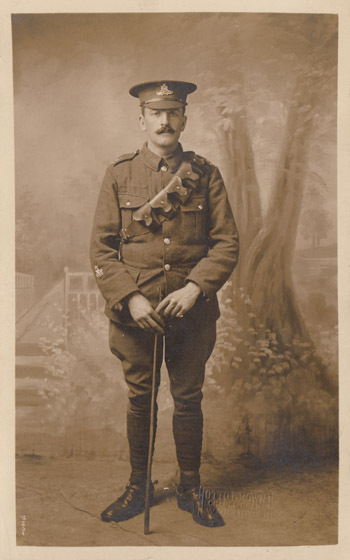 [ABOVE] A postcard portrait produced by Otto Brown of Chapel Road, Worthing showing of a man in uniform. The postcard was sent to 'Florence' (presumably Charlotte Florence Pollard) and signed 'From the Houseboy'. The postcard carries the message 'Happy New Year' and is dated '1915'. 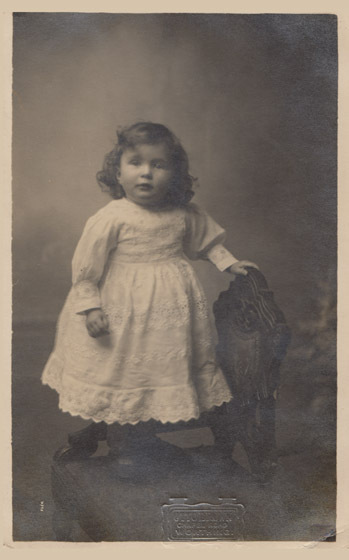 PHOTO: Courtesy of Lorraine Haldane [ABOVE] A postcard portrait of a young child standing on a chair, photographed by Otto Brown of Chapel Road, Worthing. 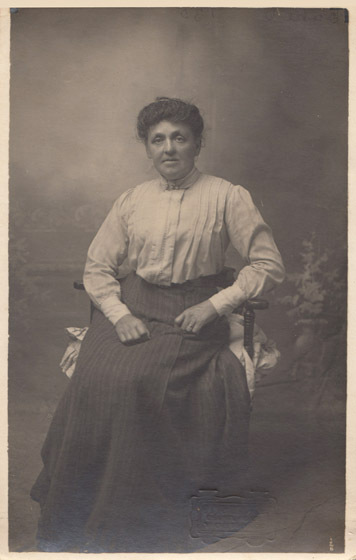 [ABOVE] This postcard portrait by Otto Brown of Chapel Road, Worthing showing a middle-aged woman seated on a chair carries the label "Granny Caesar", but the lady in the photograph does not bear a strong resemblance to Mrs Sarah Caesar (born 1866, Pycombe), the mother of Charlotte Florence Pollard. [SEE BELOW]. The photograph dates from around 1910. Sarah Jane Pollard was born in Pyecombe, Sussex, in 1866, the daughter of Mary and William Edward Pollard, a carpenter and wheelwright of West Hoathly. Sarah Jane Pollard went into domestic service, but at the age of twenty-two she fell pregnant. In September or October 1889, Sarah Jane Pollard, an unmarried woman in her early twenties, gave birth to a daughter Charlotte Florence Pollard, who was baptised at Ardingly, Sussex, on 27th October 1889. For much of her working life, Sarah Pollard worked as a 'Cook' in domestic service. Charlotte Florence Pollard, Sarah's young daughter, was raised by her grandparents, William and Mary Pollard, in the Sussex village of Ardingly. 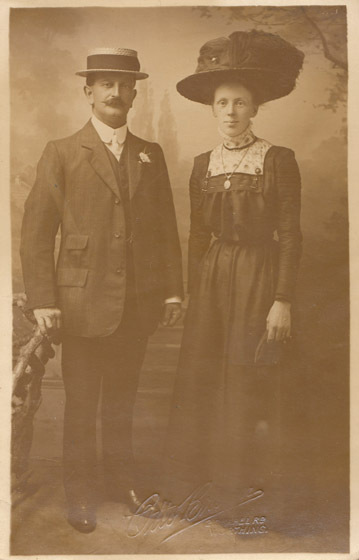 In 1898, Sarah Jane Pollard married a 37 year old widower Joseph James Caesar (born 1861, Brighton), who worked in Brighton as a 'Grainer' and 'House Painter'. Mrs Sarah Jane Caesar was widowed in 1907 and by 1911 she was working as a 'Sub- Matron' at a young women's 'Shelter' in Eastbourne. 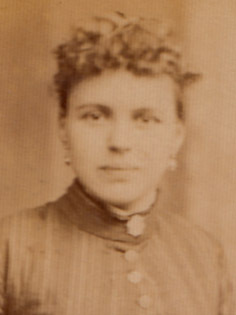 Sarah Jane Pollard (born 1866) photographed in 1889. [Detail from the carte-de-visite below]. Charlotte Florence Pollard (born 1889) and her mother Mrs Sarah Jane Caesar (n�e Pollard) photographed in 1916. [Detail from the postcard portrait below]. 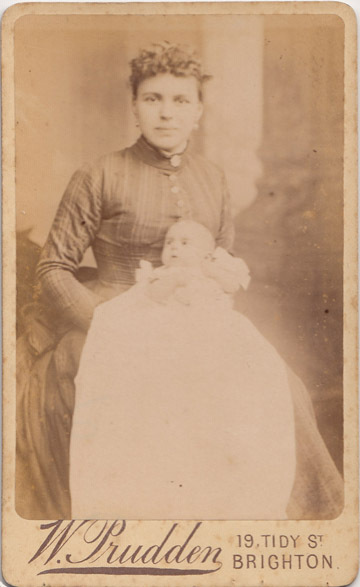 [ABOVE] A carte-de-visite portrait of Sarah Jane Pollard with her baby daughter Charlotte Florence Pollard, a photograph taken in 1889 by William Prudden of 19 Tidy Street, Brighton. In 1889, Sarah Jane Pollard was an unmarried mother of 23. [ABOVE] A 'Midget Carte' portrait of Sarah Jane Pollard, taken at Mora's Brighton studio around the time of her marriage to Joseph James Caesar in 1898. Sarah was in her early thirties at this time. 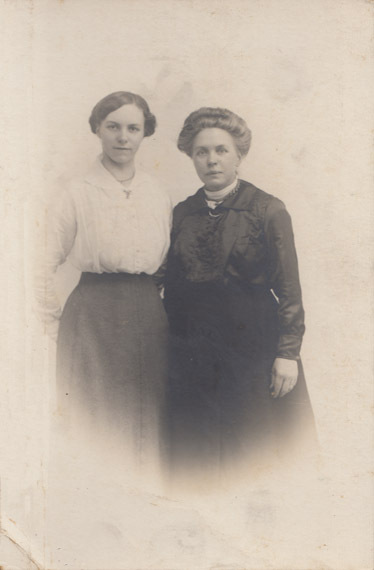 [ABOVE] A postcard portrait of twenty-seven year old Charlotte Florence Pollard and her 50 year old mother Mrs Sarah Jane Caesar (n�e Pollard) photographed in 1916 at The Ideal Studios, 120 Western Road, Hove. 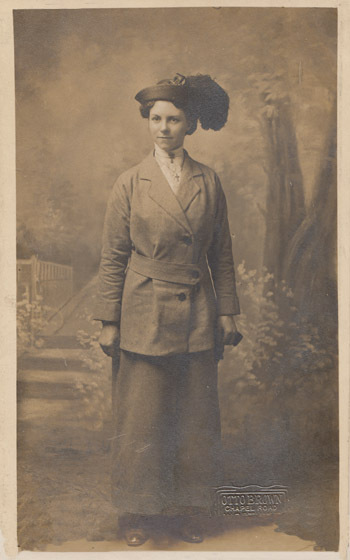 Sometime around 1909, Charlotte Florence Pollard, who was known as either 'Lottie' or 'Flo' to her family and friends, went to work as an "Under Housemaid" at 'Sompting Abbotts', a country estate in West Sussex belonging to the Crofts Family. 'The Abbotts' at Sompting was a manor house which was once owned by Henry Peter Crofts (c1819-1890), Justice of the Peace and Deputy Lieutenant of Sussex. By the time Charlotte Florence Pollard entered domestic service at 'The Abbotts', Sompting, the house was occupied by Henry Crofts' widow, Mrs Ellen Merriall Crofts, and her unmarried daughter, Gertrude Mary Crofts (born 1856, Sompting). The 1911 census of Sompting Abbotts records seven female servants (all unmarried) residing at 'The Abbotts'. [See the panel below for details of these domestic servants]. It appears that Charlotte Florence Pollard was in service at 'Sompting Abbotts' from 1909 until shortly before her marriage to Alfred John Duke (born 1887, Sompting) early in 1917. Letters and postcards were sent addressed to Miss C. F. Pollard at 'Sompting Abbotts, near Worthing, Sussex' between 1909 and 1915. By 1917, Miss C. F. Pollard was residing at 24 Brunswick Terrace, Hove, Sussex, where she continued to live after becoming 'Mrs A. J. Duke'. 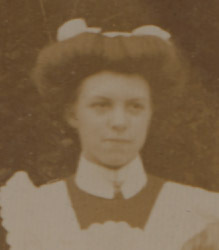 Charlotte Florence Pollard as an 'Under-Housemaid' at 'Sompting Abbotts', Sussex. Detail from the photograph on the right. Details of the Domestic Servants at 'Sompting Abbotts', as given on the 1911 Census Form: Isabella Lavell (62) 'Maid Attendant'; Mary Kail (37) 'Cook'; Louisa Jones (34) 'Parlour-Maid'; Susan Balmer (47) 'Housemaid'; Charlotte Florence Pollard (21) 'Under Housemaid'; Elizabeth Price (52) 'Laundry-Maid'; Lilian Blackman (24) 'Kitchen-Maid'. 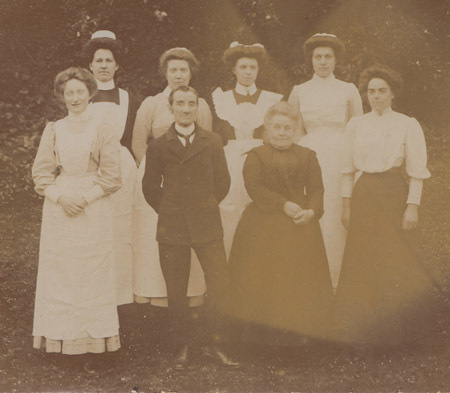 [ABOVE] The domestic staff at 'Sompting Abbotts', Sussex, photographed around 1910. Charlotte Florence Pollard, who was employed as an 'Under-Housemaid' at 'Sompting Abbotts', is standing in the back row, second from the right. 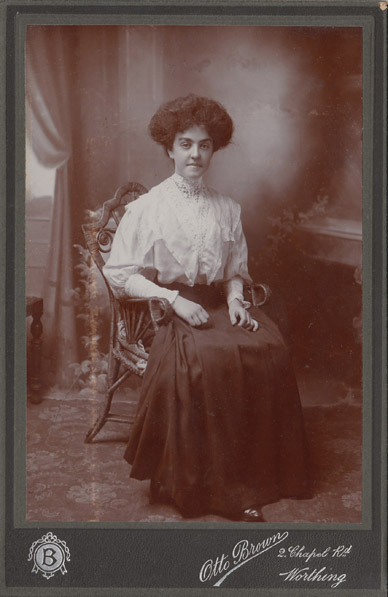 [ABOVE] A postcard portrait of a woman seated on a chair, photographed by Otto Brown of Chapel Road, Worthing. Inscribed on the reverse of the postcard is the date '1914'. 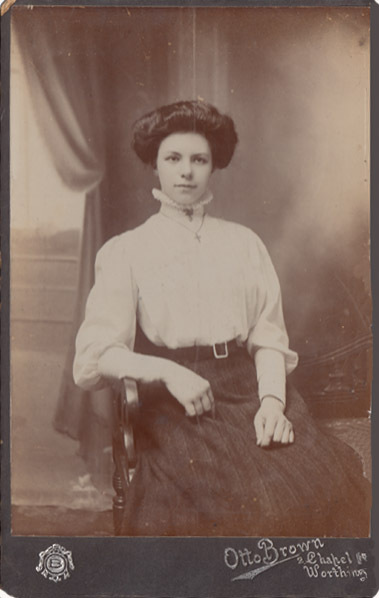 [ABOVE] A postcard portrait of a young woman identified as 'Alice Duke' and dated 'December 1910', photographed by Otto Brown of 2 Chapel Road, Worthing. [ABOVE] A postcard portrait of a married couple', photographed by Otto Brown of 2 Chapel Road, Worthing (c1910).